Fresh yeast, also called baker’s yeast, cake yeast or compressed yeast is my preferred type of yeast when making bread. It should be kept in the fridge and lasts up to 4 weeks. Fresh yeast has no artificial additives. Although not widely available in Australian shops, it is possible to find it in some delis and bakeries. 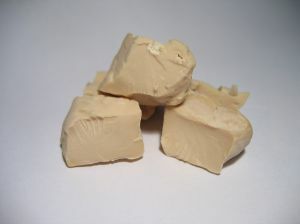 To buy fresh yeast look for a nice creamy colour without any dark or dried out spots. It should smell pleasantly and crumble easily. Greyish yeast that is stretchy and gummy is past the required freshness and might produce unsatisfactory loaf. If in doubt, mix a small amount of yeast in some warm water with a tablespoon of flour. If it rises, it means it’s still active. Dry yeast on the other hand can be kept for up to 2 years. This is especially handy if you don’t bake with yeast very often. However, dry yeast usually contains additive sorbitan monostearate (E491). Fresh yeast packaging differs significantly. In Australia it’s commonly produced in 1 kg blocks and then cut up into prepackaged small chunks or sold at the counter according to the customer’s requirements. US cake of fresh yeast is packed in 0.6 oz or 17 grams. If a recipe of European origin asks for a cube of fresh yeast, the required weight is 42 grams or 1.5 oz or 2.5 US cake portions. I am making brioche, and it says to dissolve the fresh yeast in milk. If I am using dried yeast do I still need to put it in milk or do I skip that step? You can skip that step and mix dried yeast straight into the flour. I’ve had real trouble finding fresh yeast. I’m quite near you in Melbourne. Can I ask where you buy fresh yeast? Bakers Delight in Camberwell sells fresh yeast. A recipe I’m using for brioche asks for 4g of fresh yeast as I don’t have any I’m having to use dry. Using your conversion it means 1.3g of dry yeast. Seems too little yeast perhaps? Would you use the reduced amount or just a sachet of dry yeast 7g and hope for the best? Whether or not 4g of fresh yeast is a small amount depends on how much flour is in that recipe and what is the recommended proving time. Given that brioche has eggs and butter added (that requires a bit more yeast to get that rich dough in action), does the recipe ask for overnight proving? Less yeast improves taste, but requires longer rising time. Without the recipe it’s hard to know what would be best, but I would suggest you use 1/2 a sachet and follow the recipe. Hope this helps. Let me know how did your brioche turn out. i am substituting fresh yeast for a recipe that calls for dry yeast. As a result I am not sure when to and how to add the fresh yeast. Your help is greatly appreciated! If you’re kneading the dough by hand, it’s best to dissolve the fresh yeast in a little water, than pour it into the flour with the rest of the liquids. If using a mixer with a dough hook or a bread making machine, you can can crumble the yeast directly into other ingredients. I assume that the recipe is of US origin as it’s asking for a cake of yeast which is 0.6 oz. Converted to dry yeast it’s about 1/4 oz. or 7g envelope. Most recipes these days call for active dry yeast or instant but I still prefer to use the fresh (compressed) yeast – because this is how my mother taught me to bake – by eye or sometimes by ratio of yeast to flour. It’s hard to break a habit and I don’t seem to get the same result with the granulated stuff. Yours is the only conversion either way which I have found on the www. Thank you again so much for all your help. Thank you Vesna. your conversion is the one i have followed as being the most accurate. I too prefer working with fresh yeast as my mother taught me. You’re welcome Claude. Happy baking! Hello has anyone used fresh yeast in there bread machine on the dough setting. If any one has I would love to know how you got on and your method. I’m in the UK and I have a Panasonic Bread machine. You can use fresh yeast in bread making machines. Simply crumble the yeast into the liquid (no need to cream it first), add other ingredients and set the program. I did have a play and did as you suggested and my loaf turned out really well. I also tried crumbling the fresh yeast into the flour as suggested by a French baker and that worked also. I put the tepid water at the bottom of the pan, then the flour with yeast and sprinkled the salt at the very top. I have given up using dried yeast now. Thanks for the conversions and advice re bread machine . Ive just switched it on , so fingers crossed. Hi I am making a mexican bread and I need 30 grams of dry yeast I dont know what to measure it in I have tablespoons, a measuring cup and teaspoons but how much do I PUT IN THEM IF I CANT measure in grams with these objects. I would like to hear if you know what to do with dry yeast. I am from Denmark and my recipe says I need to mix 25g fresh yeast in cold water, but since I am in Canada I can only find dry yeast and on the package it says to put it in hot water. Should I put it in hot water as it says or can I put it in the cold water as my recipe says? Generally, it’s better not to put any yeast into hot water, especially fresh yeast, as the high temperature might kill it (yeast is living thing). Dry yeast tolerates warmer liquids than fresh though: by the time it absorbs the liquid, it cools down a bit. If using dry yeast I put it straight into the flour, but the rising process is faster if you hydrate dry yeast beforehand. The safest thing is to put whatever yeast you have in lukewarm water. Your conversion looks good but I am using a recipe for a panettone which asks for 90g fresh yeast, which would convert to 30g dried yeast. That seems like a lot, although the recipe also calls for 5 cups of flour. What do you think? Suzanne, although sugar, eggs and dried fruit in doughs call for more yeast, 90 g of fresh yeast sounds a lot for 5 cups of flour (roughly 700 – 750 g). Without the recipe it’s hard to guess, but I wouldn’t put more than 10, max. 15 g of dried yeast. Less yeast might lengthen the proving time, but you’ll avoid yeasty flavour. My European recipe calls for 80grams of fresh yeast what would the conversation to dry yeast be in teaspoons or packets. Please refer to the conversion table above.